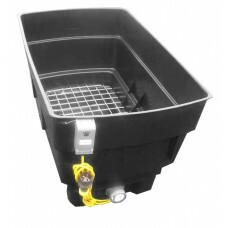 Curing Tank for up to 30x150mm Concrete Cubes, made from Polyethylene and measuring 990x686x635mm overall. It is fitted with a 220 volt 3kW Heater but also works on 110v (heating taking a little longer), fitted with mechanical thermostat and a galvanised mesh lower rack. The thermostat is factory set to control the Tank at 20C. It is ideal for site use where an economical solution is required.